Is Testo's 557 refrigeration gauge the ideal HVAC instrument? Is Testo's 557 refrigeration gauge the ideal HVAC instrument? Is Testo's 557 refrigeration gauge the ideal HVAC instrument? What makes the testo 557 digital manifold refrigeration gauge the ideal HVAC/R instrument? High-quality refrigeration gauges and testing instruments are vital assets for technicians to excel in the heating, ventilation, air conditioning and refrigeration (HVAC/R) sector. Flexibility to fulfil multiple testing functions and the ability to collate data are sought after features for HVAC/R instruments – making the testo 557 digital refrigeration gauge a wise purchase for anyone in the industry. Pressure levels. This data helps to calculate the theoretical evaporating and condensing temperature of the refrigerator. The testo 557 device's two temperature-compensated pressure sensors make automatically recording this data seamless. Superheating and subcooling temperatures. These are critical to the refrigeration cycle, which makes accurate data calculation essential. Testo's solution replaces manual summation with a digital process, to reduce time and the risk of human error. Vacuum measurement. The instrument's precision Pirani vacuum gauge digitises this step and makes it easier than ever to evacuate refrigeration systems for testing. 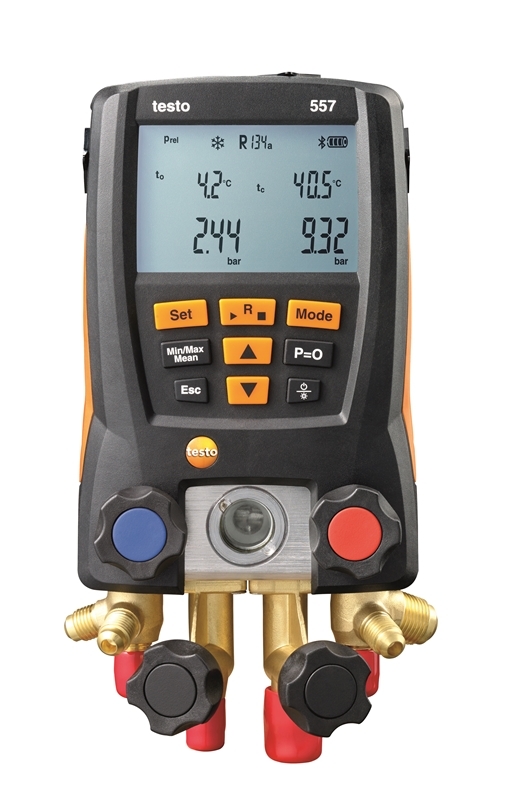 Testo's 557 refrigeration gauge does the job of multiple HVAC/R testing instruments in one. Testo's 557 refrigeration gauge was designed for flexibility, with its accessory set fulfilling this demand. The testo 557 comes with clamp temperature probes, for reliable measurement of surface temperatures. All you do is clamp the probe to the cables, and your toolkit is one instrument lighter. The automatic heat pump mode means there is no need to switch refrigerant hoses between tasks – the solution is good to go, whenever you need it. But there is no point in designing a high-quality HVAC/R instrument if it's too big to be carried practically, or isn't robust enough to face the rigours industry technicians. Luckily, the testo 557 digital manifold ticks both of these boxes. Its sturdy housing is industry tested for shock absorption (in compliance with protection class IP 42) but is still compact enough to be used as you would any other HVAC/R solution. The suspension hook and illuminated display also make it easier to use in areas with little room or poor visibility. 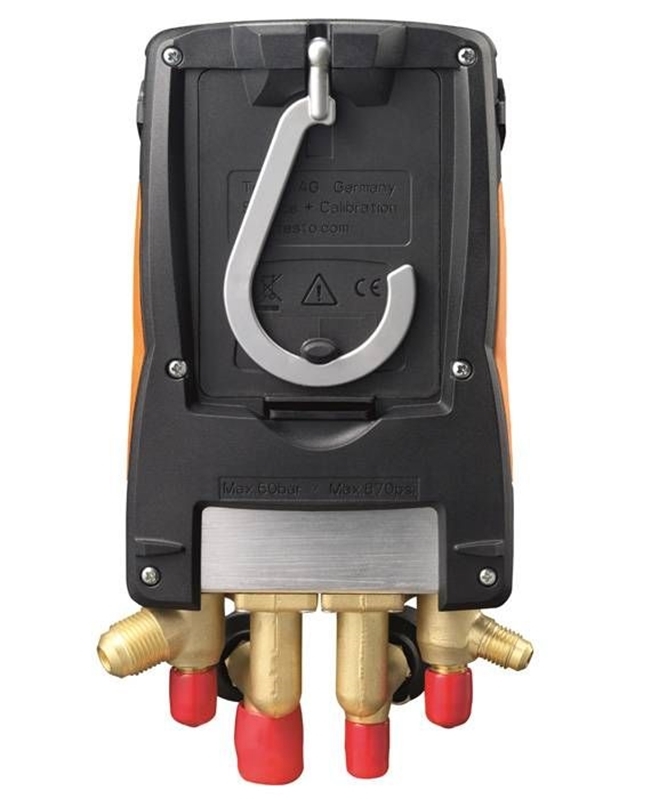 Testo's 557 design is optimised for ease-of-use – the hook on the back means technicians can work hands-free. To further the amazing features of the testo 557 refrigeration gauge, the solution is completely digitised and linkable to your smartphone or tablet device. Gone are the days of scribbling readings down on a scrap of paper – Testo's 557 instrument collates and transfers all this data for storage on any smart device of your choice. All you have to do is download the Testo app and you are ready to begin. Technicians who go digital give themselves a significant advantage over others in the industry still using outdated analogue testing solutions! For more information about the testo 557 digital refrigeration gauge, contact the Testo team today.